On Friday night last week, Sen Cory Booker was on the campaign trail in Iowa. When he was asked a question, he invented a language. Barack Obama did it with his remark in 2009 about speaking “Austrian” (also nonexistent), so we guess he thought that it was ok. But he’s a little nervous for a presidential candidate and didn’t come off sounding particularly intelligent in an exchange with a reporter from Swiss radio. 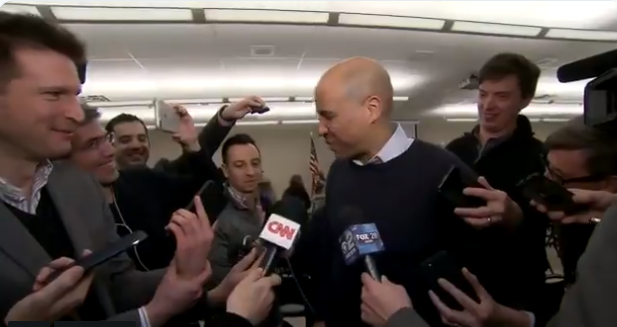 The reporter had an accent, so Sen Booker assumed he was Spanish or Mexican or something… QUESTION: Senator this is your first day really on trail, what is your first impression? Booker: Tu hablo espanol, Si? QUESTIONER: No, Swiss radio. Booker: Swiss! Yeah, I do not speak Swiss. (nervous laugh) I cannot even say swiss cheese in swiss. “Tu hablo”??? You I speak. The impressions given by political candidates recently appear to be somewhat less than brilliant. Cory Booker Releases Confidential Emails…or did He?